Mike Ullery | Daily Call Troy firefighters battle a fire in the attic area of a home in the 1300 block of East Main Street on Monday afternoon. 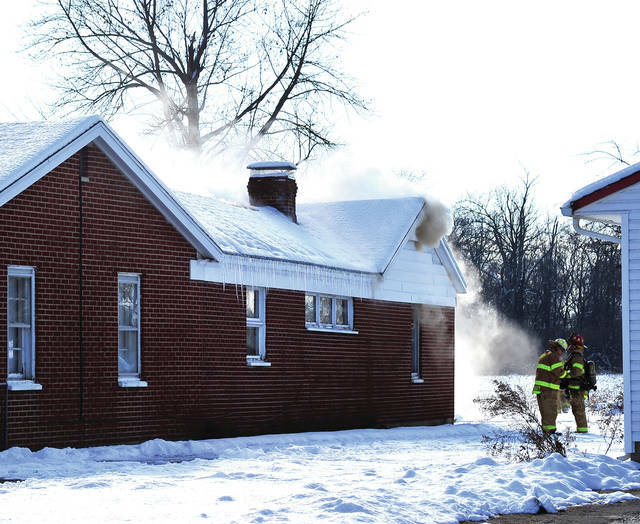 TROY — A Monday afternoon fire damaged a single-family home on East Main Street. Firefighters were called to a home in the 1300 block of East Main Street just after 1:30 p.m. on the report of smoke coming from the ceiling. Fire units arrived to find smoke coming from the roof area at the rear of the home. The resident of the home was told to evacuate the structure. Dayton Power and Light and Vectren were contacted to disconnect utilities while firefighters worked to located and extinguish the fire. Chief Matt Simmons said that the resident had apparently experienced electrical issues prior to the report of the fire and they are looking in to an electrical problem as a possible cause. No injuries were reported and neither a definite cause or damage estimate is yet available. The American Red Cross was contacted to assist the family. https://www.dailycall.com/wp-content/uploads/sites/30/2019/01/web1_011419mju_fire_tfd_eastmain.jpgMike Ullery | Daily Call Troy firefighters battle a fire in the attic area of a home in the 1300 block of East Main Street on Monday afternoon.